The Chesters, 12 Brunswick Drive, Harrogate - �695,000 with Verity Frearson, 01423 562531. For most people, the phrase “arts and crafts” conjures up nothing much more than images of pots of glue, sharp knives, egg-boxes and wool. Maybe some beads. But the Arts and Crafts movement was actually one of the most important forces ever to influence British design and architecture. An international movement, it flourished from around 1860 right into the 1930s, reaching its height of excellence here in the UK, and, significantly, giving Harrogate some of its finest houses. 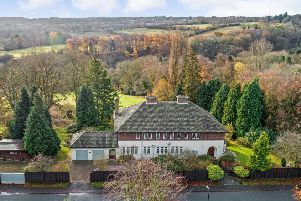 78 Cornwall Road, Harrogate - �1.325m with Hopkinsons, 01423 501201. Arts and Crafts was a reaction against what was seen as the ugly and alienating results of Victorian industrialisation, and its proponents set out to create a more beautiful and humane style. Inspired by medieval English design and the architecture of the pre-industrial past, they built rustic-influenced houses and filled them with hand-crafted fittings instead of the mass-produced alternatives that had become so prevalent. They believed that in doing so, they would contribute to the creation of a more just and civilised society. Whether they achieved that aim is doubtful to say the least, but what is sure is that their design aesthetic has largely withstood the test of time. Old Arts and Crafts houses are still hugely popular and new properties with typically Arts and Crafts features, such as exposed beams, decorative brickwork and dormer windows, are still being built all over the country. 9 Belgrave Crescent, Harrogate - �785,000 with Verity Frearson, 01423 562531. Our district’s greatest repository of original Arts and Crafts houses is probably the Duchy estate, which was developed at the end of the 19th century and the beginning of the 20th – just when the Arts and Crafts movement was at its height. The many practitioners of Arts and Crafts architecture developed the aesthetic in different ways, so it was never distilled into one uniform style of house. Nevertheless, certain features became common, and on the Duchy estate they can be found in abundance. Number 78 Cornwall Road is a detached family home built in a typically ‘Duchy’ style, with dormer windows, tall chimney stacks and half-timbering in the upper reaches. It has a master suite with bathroom and dressing room, five further bedrooms and house bathroom, top-floor office, entrance hall, study, kitchen, utility room, two reception rooms, garden room and conservatory. Outside, there are spacious enclosed garden with lawns and summerhouse, plus detached garage and plenty of off-street parking on the drive. Across town in south Harrogate, 9 Belgrave Crescent is a semi-detached house with half-timbering, mullioned bay windows and contrasting quoins. It too has six bedrooms and two bathrooms, as well as a kitchen, utility room, entrance hall and two reception rooms. Outside, there are south-west-facing gardens, storage sheds and off-street parking. Finally, back on the Duchy estate, The Chesters is a semi-detached house with many of the previously-mentioned features, plus oriel bay windows. It has four bedrooms, house bathroom, large entrance hall, kitchen, utility room, study, two reception rooms and conservatory – plus gardens and off-street parking. 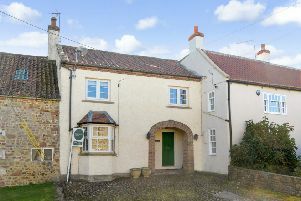 Cobblestones, Hutton Conyers - £219,950.